The early posts on this blog refer to ways to clean out the junk in your life, to reduce your debt and to get to a better place. With the exception of working too much sometimes, I've succeeded in achieving my goals. I wish you luck in achieving yours. I now use this blog to share what I find interesting. If this video is an indication, The movie "Idiocracy" is closer to real life than I thought. I have to be honest, I think it's time to flee the country. In the event that you have not seen Idiocracy, here is the introduction video that pretty much explains what is happening in the above video. The world is becoming a very scary place. Labels: Funny, Off-Topic, Video, YouTube 2 Comments - Comment now! As children, we watch educational programs on how business works and learn that making "Widgets" is what you will do as a job when you are an adult. I didn't think they were serious. I thought that "Widget" was just some placeholder name for another product, like "cars" or "ice cream" or even my dream job making comic books or movies. But alas, the joke is on me. Essentially, I actually do make widgets for a living. All laughs aside, and because I know that some of you who stop by to read this little blog also sell widgets for a living, I wanted to share this with you. 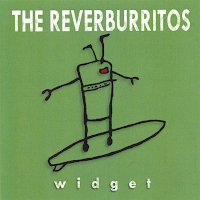 I found this album on iTunes named "Widget" by the Reverburritos. If you like surf instrumentals, this one will surely make your day. Click here to visit the iTunes store for a listen, it's actually really, really good. UPDATE: I had to add this. Just too funny. Proves my point to a "T"
* You really need more information to answer this. Labels: itunes, music, review, Widgets 0 Comments - Comment now!